Families of a child with special needs must often consider adult guardianship. It’s defined as a legal proceeding in which someone, often a parent, sibling or other family member, asks the Illinois court to find that a person is unable to manage his or her affairs effectively because of the level of special needs. A guardian thus steps in the shoes of the person with a disability and makes decisions for the person, keeping in mind his or her best interests. There are different types of guardianship depending on the person’s needs. Generally, there is a guardian of the person and guardian of the property. One person can serve as both. The different types of guardians are described just as they sound. A guardian of the person makes decisions about a person’s healthcare, housing, food, clothing, and other subjects that affect the person. A guardian of the property makes decisions about a person’s money, income, property, and other financial matters. Adult guardianship isn’t for everyone. Some children with special needs do not need this level of protection. And, for some individuals the process to set up a guardianship can be a psychologically difficult experience if they understand that the judge is taking away their right to make certain decisions about their life and giving it to their parents or siblings. → A joint bank account to monitor spending. 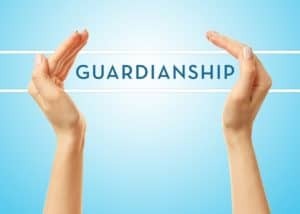 If a person is easily influenced or has trouble with money, a guardianship might be more appropriate. → A special needs trust can hold the child’s inheritance ensuring that the assets the child with special needs controls are very limited. → A durable power of attorney can allow someone else to make Decisions on behalf of an individual with special needs but it does not take away their right to make their own decisions if they want to. It allows the family to help the individual make decisions and therefore can encourage independence however it does not provide protection for the individual.